Cancer Council Australia: How Much Sun is Enough? Photo: U.S. Library of Congress, National Photo Company Collection, LC-USZ62-99824. 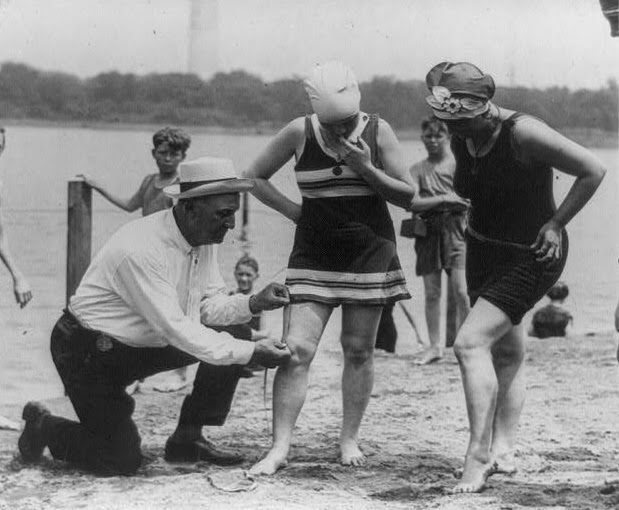 – In 1922, Bill Norton, the bathing beach “cop”, is using a tape measure to determine the distance between a woman’s knee and the bottom of her bathing suit on a beach in Washington, D.C. Col. Sherrell, Supt. of Public Buildings and Grounds, has issued an order that bathing suits at the Washington bathing beach must not be over six inches above the knee.